An eagle supervises paddlers in Lisbon. Gerry and Don in Durham. Paddling through the tunnels in Lewiston. Sneaking up into the tunnels in Lewiston. Jonathan gives a little history lesson in front of Great Falls in Lewiston/Auburn. ARWC board members Hiram Towle and Steve Wight in downtown L/A. Lovely ladies Noelle Gauthier, Sarah DeCato, and Emily Gauthier paddle in downtown L/A. Hope, love, and Great Falls in downtown L/A. Auburn Rec campers experience the Androscoggin River. Auburn Rec campers experience the Androscoggin. Jeff Parsons of Bethel Outdoor Adventure provided canoes, instruction, and comic relief for the day with the Auburn Rec campers. Having a great time at Paddle After Hours in downtown Jay. 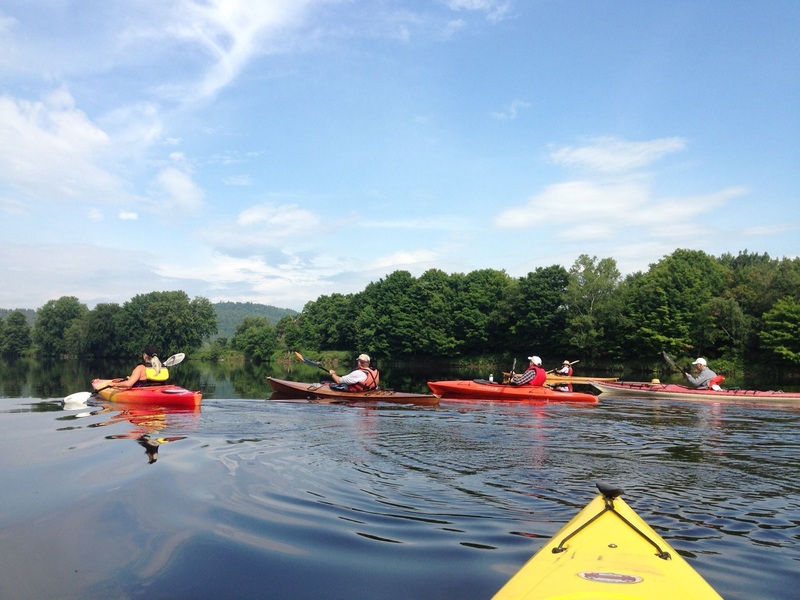 Over 40 paddlers came out for Paddle After Hours in Jay. Phil Poirier paddling in downtown Jay. Dramatic clouds provided the backdrop for over 40 paddlers at Paddle After Hours in downtown Jay. Jonathan just can't get enough of the Androscoggin. Paddling past the Verso Paper mill in Jay. Nick and Cindy set off from Riley Dam in Jay. A beautiful landscape in Canton. Ken Gallant of Verso Paper breaks in his new kayak. Two thumbs up for the Androscoggin. Paddling toward the White Mountains in Milan. 4H Campers paddle into Rumford. Staying in the shade in Hanover. The whole gang from Maine Handicapped Skiing in Hanover. Gorgeous, gorgeous day paddling with Maine Handicapped Skiing from Bethel to Hanover. Taking off from Bethel Outdoor Adventure in Bethel. Ice cream social for lunch at ARWC board member Mike Galuszka's farm in Milan. Just gorgeous in Milan, NH. Max comes along for the ride in Milan. A nice calm day paddling from Milan to Berlin. The best lunch spot on the Trek - an island in Gulf Island Pond.